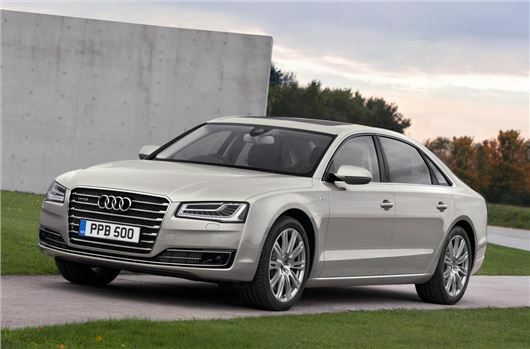 Audi has opened the order books for its updated A8 luxury saloon. The new model is priced from £58,800 and first deliveries are expected in January 2014. On the surface the updated A8 look very similar to the outgoing car, with only minor cosmetic tweaks, but the meat of the improvements are under the bonnet. Engines have been improved for increased powered, better fuel economy and lower emissions. The most obvious change to the A8 is the addition of ‘MatrixBeam’ headlights. The new headlight system uses 25 LEDs which can be dimmed, brightened or switched off individually depending on the situation, whether there is a corner ahead or an oncoming car. The system is linked to the navigation and can pre-emptively adjust to the conditions on the route ahead. The MatrixBeam system is only standard fit on the upper Sport Executive models. There are other cosmetic changes however, including new paint finish options, a reshaped bonnet and grille and changes to rear light design. The most important changes to the A8 are under the bonnet, though – the entry level 3.0 TFSI petrol benefits from a 20PS power hike to 310PS, while the 4.0 V8 TFSI gains 15PS and cylinder on demand tech to improve fuel economy. The 3.0 TDI gains8PS and the 4.2 TDI gains 35PS, meaning total outputs of 258PS and 385PS respectively. Those who want to be truly green will want to take a look at the A8 Hybrid, which combines a 2.0-litre TFSI petrol engine and an electric motor to deliver 245PS and 480Nm of torque, with up to 44.8mpg and 144g/km of CO2. There’s also the added benefit of an all electric range of almost two miles at speeds of up to 62mph. The full price list is below.